I’ve flown more than almost everyone else I know in the last ten years. I know that lots of people fly more than me based on airline statistics, but I believe they are in other lines of work than myself. For what are very complicated reasons, flying domestically (I live in the United States) has become increasingly painful in recent years. Jet fuel prices, telecommuting and remote presentations reducing the willingness for business cash-cow customers to pay huge fees, additional investment in security measures. All of these things are factors. Interestingly enough, the two most profitable airlines, Southwest and Virgin Atlantic, have very different business models. What they do have in common is that they have been very careful about their service offering and not over-extending themselves. I am over 6’2″ tall. I have large and powerful legs (I have lifted a lot of weights in the past) that do not fit in the 4′ x 2′ x 2′ little box that you are allocated for personal space. 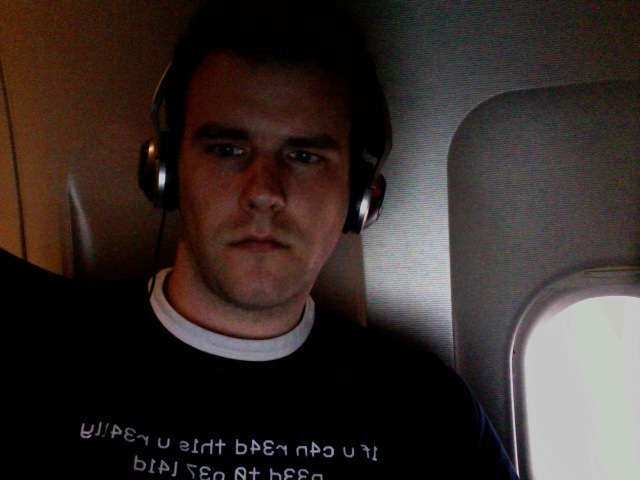 If a fat person sits next to you and spills over the armrests, you’re going to get very claustrophobic very quickly. Since I have reduced the flying I do for business, most of my commuting and weekend travel falls on Thursdays, Fridays, Sundays, and Mondays. There are enough platinum/exectutive/diamond flyers taking up the reduced space in the first class compartment to guarantee that I, without at least moderate elite status, will not be upgraded. What is a nerd to do? I now pick underutilized flights, get a window seat, and sit sideways with my laptop or reading material hogging the middle seat. As you can see, the windows are behind me. My knees tend to end up in the middle of that middle seat area with the arm rest folded up. It’s not restful, but my legs aren’t jammed up making possibly life-ending clots. I try to present with telepresence or a combination of conference calls and web-based presentation tools under most circumstances. This allows me to actually open my laptop and write things, like this blog posting for instance, and have it facing away from the isle. This also reduces the amount of people who have access to snooping on me while I work. Personal media player with cheap noise canceling headphones (I have an old pair of Aiwas that I purchased 8 years ago for $50 from an electronics chain.) You can spend a lot on noise-canceling technology, but the cheap stuff works nearly as well as the very expensive. When I see people with the RF wireless Bose $400 headphones, I quietly laugh at them for being so wasteful. A bluetooth headset. It’s illegal to drive without one in several major markets currently and more are on the way. I like my Jawbone. The background noise canceling of it is really amazing. A smartphone with synched contacts and calendar. If you experience a hardware failure with your laptop, need quick directions from google maps, need an alarm clock or event reminders, it is really indispensable. Getting organized on a serious nerd device such as a Nokie E61 or an iPhone can really add a lot of calm to your life. A video camera. You never know when you might need to document some ad-hoc chain of evidence, capture some training material for others, or need to post hilarious videos of people later on. A camera phone, which I do not have on my smartphone to avoid client site and datacenter confidentiality issues, is almost never sufficient for this task. They just don’t capture enough data. Power converters/inverters. I never use these. If I have a 14 hour flight, I bring a book, try to capture an upgrade for comfort, and try to sleep after my power runs out. Most of the cool airlines that offer long flights across oceans have standard power outlets anyway. Everything else should be able to accept charging from usb. Even the executive class is showing up in coach. First class and business class (if it is even available) fill up quick, so you can find some really big deal people sitting next to you. Have business cards on-hand and give them one if they ask for one if you have impressed them with your small talk. Be polite, clever (if you can manage it) and not overly familiar. Don’t be obnoxious. No one likes the serious business airline pitch. Save your elevator speech for a less captive audience. Even red-eyes are packed full. I used to feel like red-eye flights, the ones that you fly all night, were my little secret. You would arrive to your flight tired and sleep the whole way and arrive first thing in the morning. I really feel sorry for the super-elite flyers. You see them in suits on Sundays because they have no time to check in at the hotel. It’s no wonder they’re so grumpy having to deal with airports, rental cars, the completely variable travel and sleep schedules. I know how I’ve felt when I’ve traveled like that, and I’m convinced it leads to an early grave.